I haven’t re-compensated the latter graph in each of these profiles. But I suspect that Thursday the 27th’s (March) Pop-Up Festival is what’s giving us such green mountains, here. We have two counters in Claremont, installed with the co-operation of Stephen Goode, Brian Kavanagh and Ashley Edwards at the Town of Claremont. These counters provide 24/7 data of who’s using Claremont’s town centre. Claremont Now are a Town of Claremont and business community management body, providing precinct marketing: place management, I’d like to call it. Of course, one of these functions is the accurate counting of shoppers, customers or even normal people all day, every day. The counting equipment is non-invasive and definitely doesn’t record any personal information. You just appear as a blob on the screen; so does your dog, actually, because my counters only read body heat. I have been asked to provide quotes for a state government project using WiFi-pinging. That is where we invade your mobile phone. That’s nearly illegal in some countries so I don’t do that. Spaghetti western, alphabetti, fruit loop style. This is the prettiest graph we make. What we do is we take all the bits and bobs – bytes and bits – that the counters produce and extrapolate them into every hour of the month – so that’s about … lots (OK, adding up here … 24 X 31 = (310 + 310 + [4 x 31 = 124]) = 620, 744 hours). 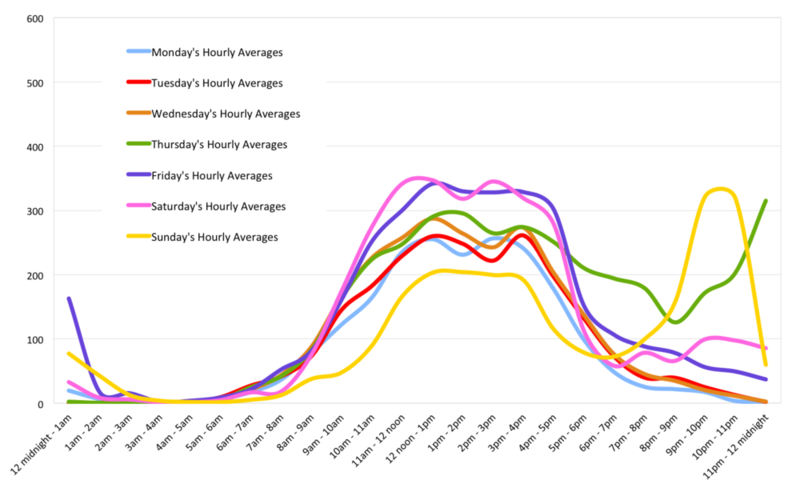 We then allocate each block of twenty-four hours to its day of the week and, hey presto, we get the average hourly trend for each day of the week. Just to play: this chart is the first one we did for you, in Claremont; Empire Furniture (is the location), 12 Bay View Terrace. (Call out to David Johns and the team there – they let us store our little internet box onsite there). This is July 2013 and isn’t it beautiful? Today, nine months later, this is what we see. Very different, yet very similar. 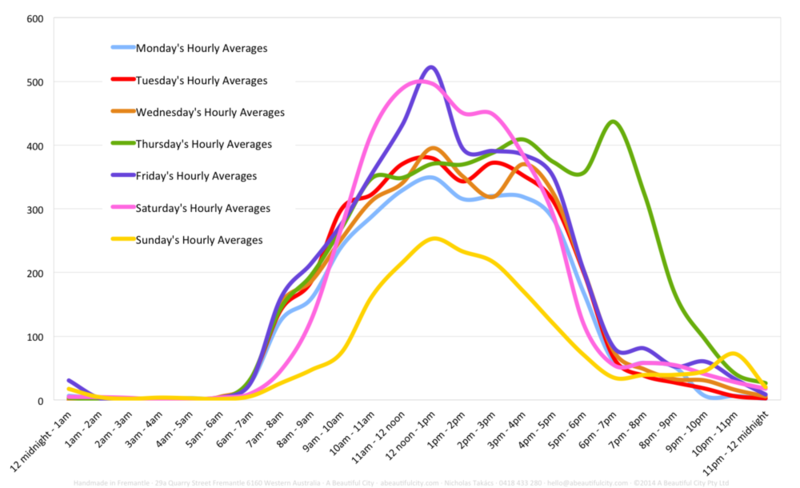 That incredible purple peak (Fridays 12 – 1pm) has obediently risen, in shape, like a soufflé. Everything else has retained it’s reasonable form. 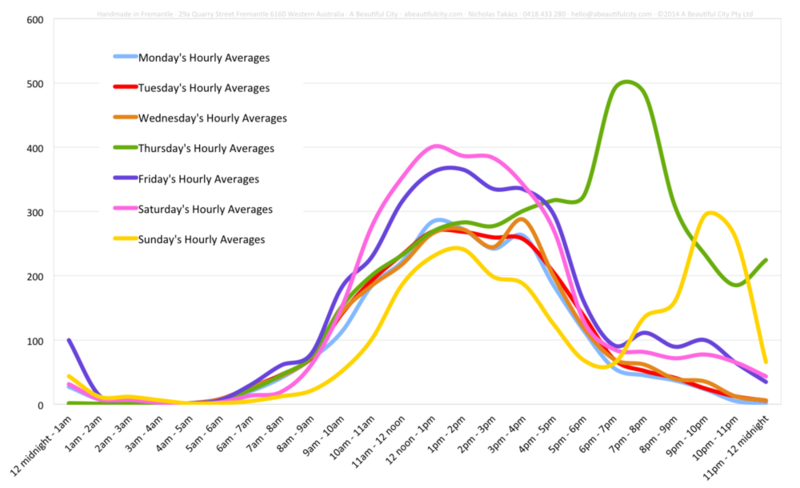 Thursdays, though, have experienced an after 5 jump (and this may just be due to the Pop-up Festival. We’ll come back next month to see – right?). But let’s cross the street to the Claremont Quarter Shopping Centre. On the ouside of the centre near Mecca Cosmetica we installed a second counter (again, with the kind help of the Claremont business community in the form of Darren Fletcher, Sean Duffin and Hawaiian, the friendly property group). 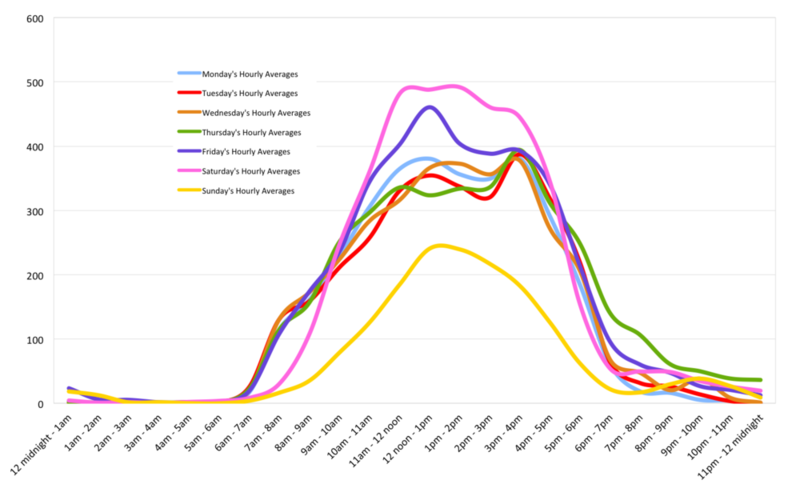 Here the foot traffic profile is very different. Less people overall (to Empire’s counter) but a real wild Sunday. Again we see that green mountain. Above: The first month of counting for us, September 2013.